KENDALL PARK, NJ--(Marketwired - October 08, 2013) - Binary Tree, the provider of SMART Migration software and solutions for migrating to Microsoft Exchange and Microsoft Office 365, today announced that it was named to the 2013 Inc. 5000 list of the nation's fastest-growing private companies. This is the seventh year in a row that Binary Tree has been named to Inc. magazine's annual list. "We just recently celebrated our 20th year in business, and to be recognized as one of the fastest growing companies in the U.S. for seven years in a row is truly an honor," stated Steven Pivnik, CEO of Binary Tree. "This recognition puts a spotlight on our incredible personnel and business partners, and is further proof of the growing momentum and market opportunity for Binary Tree's email migration and coexistence solutions for companies throughout the world." Within a letter to all honorees, Inc. magazine's Editor-in-Chief, Eric Schurenberg, stated, "To rank among the 2013 Inc. 5000, your company had to thrive through three of the toughest years this economy has seen in living memory." Binary Tree's continued revenue growth over seven consecutive years continues to validate the company's strong presence in the migration technologies and services marketplace. In addition to meeting the Inc. stringent percentage revenue growth requirements, Binary Tree has received other recognition in the technology industry throughout 2013. Earlier this year, the company was recognized as a Microsoft 2013 Messaging Partner of the Year Award Finalist, received a CRN Magazine 5-Star Award for its channel partner program, and had its E2E Complete Exchange migration software named a Best Of TechEd Finalist by Windows IT Pro. 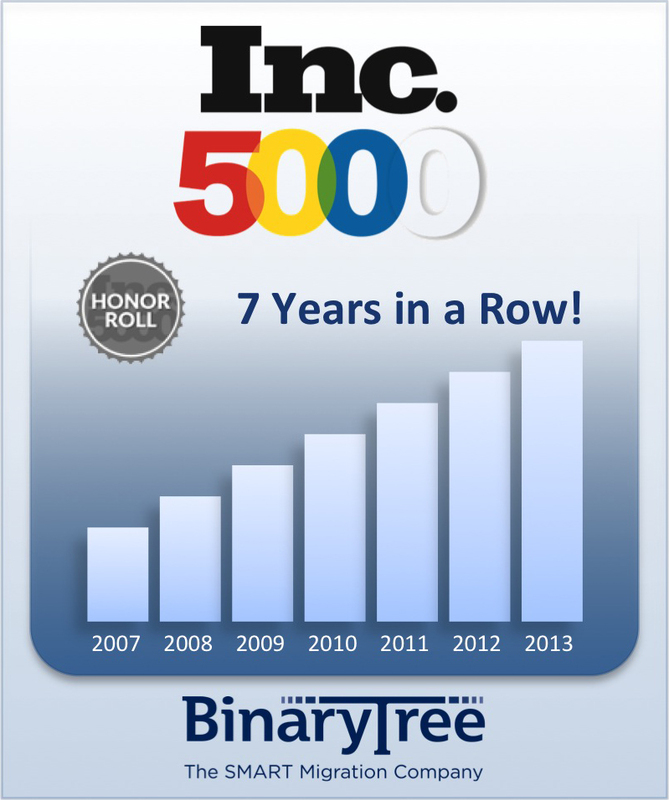 To review the Inc. 5000 company profile of Binary Tree, please visit www.inc.com/inc5000/profile/binary-tree. Binary Tree is the provider of SMART Migration software and solutions for Microsoft Exchange, Active Directory and Windows Server environments. Since 1993, Binary Tree and its business partners have helped over 6,000 customers around the world to migrate more than 30 million email users including powering many of the largest messaging migrations in the world. Binary Tree's suite of software provides solutions for migrating from Exchange 2003/2007/2010/2013 and Lotus Notes to on-premises and online versions of Microsoft Exchange as well as for performing migrations of Active Directory and Windows Server environments. Binary Tree is represented by business partners worldwide who apply the SMART migration methodology to provide specialized services for guiding customers through complex transitions. Binary Tree is a Microsoft Gold Partner, an IBM Advanced Business Partner, and is one of Microsoft's preferred vendors for migrating to Microsoft Office 365. Binary Tree is headquartered in the New York metropolitan area with international offices in London, Paris, Stockholm and Sydney. For more information, please visit us online at www.binarytree.com.